Doug Clayton is a permaculturist with a bountiful two-acre garden and orchard located at the base of Mount Monadnock in Jaffrey, New Hampshire (United States). 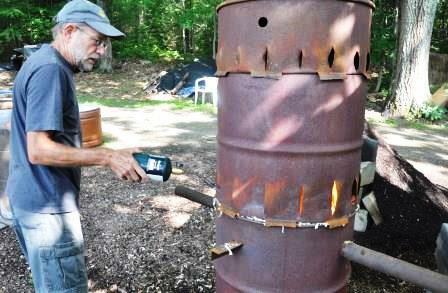 A constant tinkerer, known by some for his videos on constructing 30-gallon retorts fired with 55-gallon Top Lit Up-Draft (TLUD) gasifiers, he calls his efforts “Intuitive Biochar”. Clayton started separating charcoal from his wood stove ash in 2007 and has been working to incorporate biochar into his permaculture practices ever since. 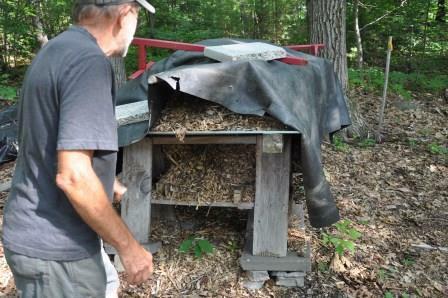 His rural homestead in New Hampshire is a perfect spot to experiment with biochar production and utilization systems. In 2008, Clayton began making biochar by the simple “barrel in a barrel” retort method and continued working with ever more sophisticated retorts until 2011, when he built his first 55-gallon TLUD. He immediately realized that the TLUD would be an excellent way to heat a retort and as a result created a retort/TLUD hybrid. The hybrid uses two so-called “waste streams”, woodchips in the TLUD and miscellaneous prunings (the ubiquitous brush piles of country life) in the retort, to make two different biochars simultaneously. Clayton doesn’t need to make woodchips for the TLUD; simply keeping eyes and ears open in his area provides a bountiful and free supply. For the retort feedstock, he bundles and chops brush piles into small pieces with a chainsaw. Air drying of both feed stocks is important and this is achieved with various loose fitting tarps and tin roofed shelters. Wood chip piles left uncovered or tightly covered begin decomposing quickly. For Clayton, time spent drying and staging biochar feedstocks rivals the time spent hand-turning compost piles. The hybrid units are constructed from salvaged 55- and 30-gallon drums, miscellaneous pipes, angle iron scraps, etc., that are cut up and modified with a 4” angle grinder and metal cutting blades. No welding is required. Clayton’s most recent iteration uses economical 12-volt “bilge fans” and simple speed controllers to regulate primary and secondary air inputs, resulting in clean, virtually smokeless, combustion of the wood gas. The operator can light the unit, adjust the airflows, make sure it is running well, and then do other work while it is firing, checking on it from time to time to adjust the airflows, as needed. A full burn with a loaded unit takes a little over an hour and a single operator could, by staggering start times, run 2 or 3 units at the same time to maximize their rate of production. The 30-gallon retort portion of the unit typically reduces its volume by half yielding 15 loosely packed gallons of high adsorbing char and the TLUD portion yields a similar (but more densely packed) volume. Early on in his biochar work, Clayton made the mistake of putting biochar directly into garden beds and observing no or negative results. At that point, he was unsure what he needed biochar for since his gardens were already fertile from 30 years of soil building and he didn’t seem to have any problems that needed fixing. But by the fall of 2009, he was producing significant quantities of biochar and had been educated on the advantages of incorporating biochar into a composting process and adopted this as his modus operandi. He began having positive experiences and realized that nutrient recycling was the use he had been seeking. Looking at his land through a permaculture lens, one of Clayton’s challenges is the capture and storage of nutrients to add back into the gardens and orchard. Composting has always been one of his strategies to accomplish this and he feels biochar has made that strategy more effective, especially in regards to conserving the nutrients typically lost in urine. Since approximately 60% of the nutrients exiting the human body are in the urine, and it being essentially sterile, attempting this relatively easy recovery is essential to him. Biochar’s ability to both adsorb and absorb is particularly helpful in the winter months when there is no opportunity for direct application to growing crops. The compost piles are seasonal in terms of available materials to construct them but are always layered with biochar initially and additional biochar is added with turnings. 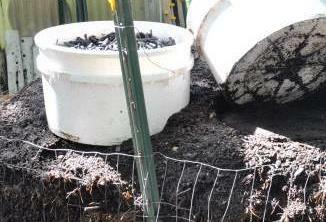 This additional biochar has sometimes been treated with molasses, fish emulsion, seaweed, etc., but mostly with urine. Typically piles are turned by hand twice and the second turning is processed through a hammer mill. The piles take 6 to 12 months from start to finish and as they mature their percentage of biochar increases as it does not break down and decrease in volume like the other organic materials. The piles go through an initial heating phase where they may reach a sterilization temperature but no attempt is made to keep them hot with frequent turnings and worms soon take over much of the work. Clayton speculates that passing biochar through worms’ guts is a great way to inoculate it with microorganisms. To this end, perforated tubs of biochar are placed on top of the compost such that a little chopping with a shovel (as buckets of liquid nutrient are applied) results in a wash of black liquid running out of the tubs and into the pile. The worms first congregate here and are often observed actually migrating into the tubs of nutrient soaked char. 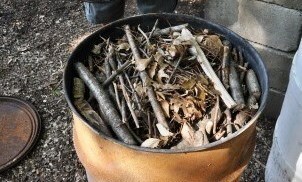 Making biochar from small pieces of wood and then composting it in the manner described negates many of the dust problems associated with grinding biochar, even though the final treatment is running it through a hammer mill. The final product is a dark and fluffy blend for use on all the gardens, fruit trees, and as a potting soil and seed starter. Clayton estimates that the mix contains between 15 – 20% biochar and he does about 15 runs of the production unit annually to produce enough biochar for 5 or 6 yards of compost. Clayton and his spouse (founding members of Land Trust at Gap Mountain) started clearing their 2 acre leasehold in 1982, built their passive-solar home largely from the trees derived from the clearing (still in process), designed in many “alternative” systems including roof water catchment/cistern storage, grey water recycling, composting toilet, etc. and they have a new 3.4kW PV array. Biochar is already making it into the composting toilet and they are planning to use it for water treatment as well. 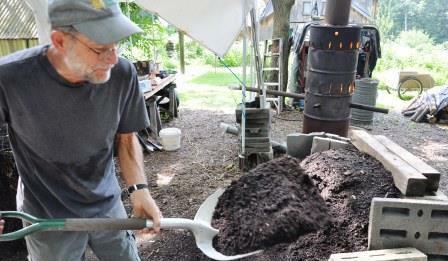 Intuitive Biochar is looking to expand these types of systems for other small farms and homesteaders. For more information, please contact Doug Clayton at dnclayton@myfairpoint.net.